Hamza Gabar set soldiers, IDF trucks on fire with Molotov cocktails, planned to establish terror cell to shoot Israelis. The Jerusalem district attorney has submitted an indictment to the district court against Hamza Gabar, a 27-year-old Arab terrorist and resident of Atarot in northern Jerusalem, who threw Molotov cocktails at security forces while taking part in riots for several years. The indictment refers to several riots that took place starting in 2012 up until recent months, in which police and security officers were attacked with firebombs, glass bottles, rocks, fireworks, and burning tires. 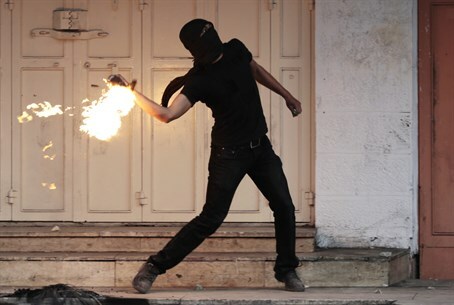 In one of the riots last July, Gabar and other Arab terrorists threw firebombs at several soldiers, and in the process set the pants of one of the soldiers on fire - he was able to put out the flames with his hands. In another riot last September in A-ram Square, the terrorists pelted IDF soldiers with rocks, with one of the projectiles shattering the window of a military truck passing through the scene. After the glass shattered the rock continued hurtling forward, wounding the truck driver. The rioters then threw a firebomb underneath the truck, causing it to swerve and slam into a wall and iron barrier. Gabar threw a Molotov cocktail at a military jeep in another incident as well, setting it on fire and damaging it. And last November, Gabar looked to take his attacks to the next level, contacting others about establishing a terror cell to conduct shooting attacks on Israeli targets. The potentially lethal danger of firebombs was recently illustrated in an attack outside Ma'ale Hashomron in Samaria, in which Arab terrorists set a car on fire with Molotov cocktails, critically wounding 11-year-old Ayala Shapira and lightly wounding her father Avner. Ayala regained consciousness a week later last Thursday, and continues to be hospitalized at the Sheba Medical Center in Tel Hashomer in serious but stable condition; the public is asked to continue praying for the full recovery of Ayelet bat Rut.